 Tågset typ DRG "ET 194"
Tågset typ DRG "ET 194"
Denna produkt ger dig 5194 bonuspoäng. Tågset typ DRG 'ET 194', digitaldekoder, ljudmodul och högeffektsdrivning, totallängd över buffertar 31 cm, epok II. Train Set with the Class ET 194 Freight Powered Rail Car. Prototype: German State Railroad (DRG) class ET 194 (former LAG 895) electric powered rail car. 'Bottle Green' paint scheme. Road number ET 194 11. One acid container car with twelve containers and a brakeman's cab, painted and lettered for Kali Chemical, Inc. Berlin, Germany, used on the German State Railroad. One type Ghs Oppeln boxcar, welded design without a handbrake and without a brakeman's cab. Model: The ET 194 has a digital decoder and extensive sound functions. It also has controlled high-efficiency propulsion. Two axles powered. The dual headlights change over with the direction of travel, will work in conventional operation, and can be controlled digitally. The cab lighting can be controlled digitally. Maintenance-free, warm white LEDs are used for the lighting. The acid container car has detailed, finely constructed open framework supports and is loaded with acid containers. 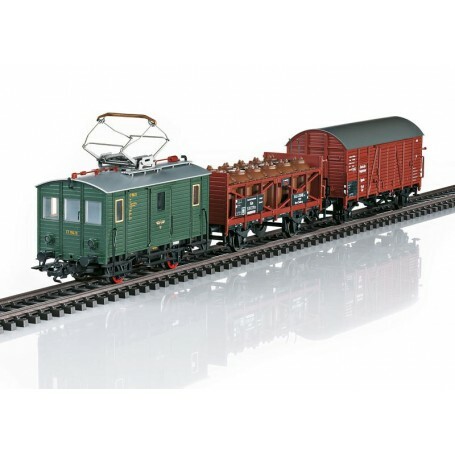 The Oppeln boxcar does not have a brakeman's cab or a handbrake. Total Length over the buffers approximately 31 cm / 12-3/16'. Highlights: First time with a DCC/mfx digital decoder. First time with sound functions. First time with LED lighting. First time with cab lighting. Train Set with a Class ET 194 Powered Freight Rail Car In 1930 the Lokalbahn Aktien-Gesellschaft (LAG) München / Munich Local Railroad, Inc. (LAG) treated itself to a small powered freight rail car for the freight service on its 5.206 km / 3.254 mile long electrified line (550 volts DC) Türkheim Bad Wörishofen. This LAG 895 was built by MAN/SSW from an old baggage car whereby the two wheel sets were each driven by a self-cooled DC series motor. There was a large baggage area between the two engineer's cabs, and it was accessible from both sides by a sliding door. Starting resistors and the compressed air equipment were installed in two boxes in the load area. The route Türkheim Bad Wörishofen was opened on August 15, 1896 by the privately owned Localbahn Actiengesellschaft Wörishofen / Wörishofen Local Railroad Company and was among the first electrified railroads in Germany. The famous priest and hydro therapist Sebastian Kneipp initiated and promoted the railroad. He was hoping for a boom for this health resort by connecting Wörishofen to the large, wide world of railroading. The Wörishofen Local Railroad Company was dissolved as early as 1905 and the railroad came under the Fittiche group of the Munich Local Railroad, Inc. (LAG). The financially crippled LAG was nationalized on August 1, 1938 and the Bad Wörishofen route with its motive power and rolling stock thereby became part of the German State Railroad (DRG). With the outbreak of World War II, electric operations on this route had to be halted on September 12, 1939 due to the neighboring airport. The former LAG 895 (starting in 1940/41: ET 194 11) thereby lost its reason for existence and was put in storage. In 1943, it went to the former LAG route Bad Aibling Feilnbach. It remained there but also in storage, and was finally scrapped in 1947. Naturally, LAG 895 also served as a powered rail car to pull other cars, and thus the acid container car for the firm Kali-Chemie AG Berlin and a type 'Ghs Oppeln' boxcar form an absolutely prototypical consist. The pot container cars for the transport of (dangerous) chemicals were as a rule equipped with twelve earthenware pot containers, each good for 1,000 liters / 264.17 gallons, which soon gave them the nickname 'Twelve Apostles Cars'. The freight car type 'Oppeln' owed its existence to the DRG's call for higher speeds in less-than-carload-lot service. The long wheelbase of 6,000 mm / 19 feet 8-1/4 inches allowed a reliable maximum speed of 90 km/h / 56 mph for the 'Oppeln'. The newly applied welding technology with its associated savings in weight led to an increase in the load weight. Twenty eight thousand of this freight car type were built by 1943. A notable characteristic of the type was the high quality truss rod frame necessary due to the long wheelbase.